← What will your library look like? The focus of my library is an easy flow of communication and a feeling of community between everyone in the library. I’ve created a welcoming space in the center of the space where students can sit and read and also work on their computers. To the side are classrooms and a computer lab but for this library to be effective, the aim is to have students feel welcomed as they enter the space. 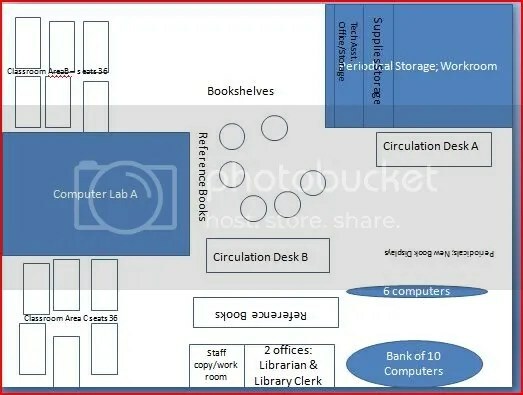 So the circulation desk and new desks greet them as they enter along with seeing their fellow students at work in the central space. I found this discussion of redesigning libraries fascinating and more difficult than I expected because I didn’t have a clear sense of how to transform my values into a library space. Part of the difficulty came about for me, because with all the different factors that are involved, I just wasn’t as clear as I would like to be of how to put across my values in the space. This is something that I think I’m going to keep revisiting and thinking about, because what I have now doesn’t feel like it matches up with what I’d like just yet.